George Romney Limited was established in 1918 as a sweet wholesaler by Mr Sam t. Clarke. At the height of one summer season he was unable to obtain supplies of Kendal Mint Cake so he purchased an old recipe and started his own manufacturing business. His first factory was in Leighton’s Yard, Highgate (Kendal). This was later moved to the Waterside Works and then to a purpose built factory on Mintsfleet Industrial Estate where it remains to this day. It has remained a small family run business and now with the fourth generation of the founder’s family. 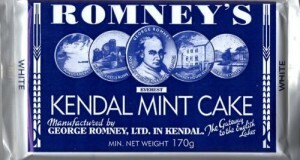 Romney’s produces about 150 tonnes of Mint Cake each year. As well as its own varieties, it also continues to manufacture the original Wiper’s brand of Mint Cake. The recipe and the production of Kendal Mint Cake has changed very little over the years, the Mint Cake is still being stirred by hand in the original copper pans. We guarantee all Kendal Mint Cake supplied will have a BEST BEFORE of at least 4 months or your money back in full. Romney’s Kendal Mint Cake was the first Mint Cake to be successfully carried to the top of Mount Everest on 29th May, 1953.